Looks like the Grand Hotel in downtown Minneapolis has sold for $33 million to Pebblebrook Hotel Trust. According to Business Wire, the new owner plans on investing $4.5 million into building renovations. 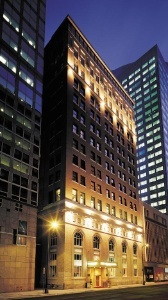 The building will continue as a top luxury hotel for Minneapolis. The building was originally opened in 1915 as the Minneapolis Athletic Club, built by Bertrand and Chamberlin. Its short stature of 12 stories can be attributed to a 1920’s height restriction. Wow, that looks like a great property in Minneapolis. It sure has that ‘historic’ feel to it.